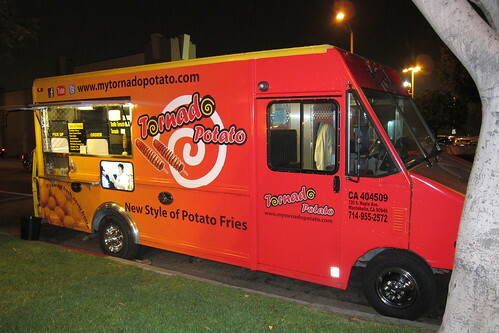 Food Truck Friday: Tornado Potato Hits L.A. The sausage tornado potato with cheddar cheese powder. You say tor-nay-doh, I say tor-nah-doh. You say po-tay-toh, I say po-tah-toh. Let's not call the whole thing off. The tornado potato that's already touched down in Korea and Köln (with pit stops in Minnesota and New Jersey), has finally hit Los Angeles. Roaming our city since at least early October, the My Tornado Potato truck (@mytornadopotato) brings the shameless gluttony of the county fair food to the food truck. Unlike most carnival fare, the tornado potato has an advantage: It tastes almost as good as it looks. The concept is fairly simple. Jab a stick through a potato. Insert the speared tater into a specialized slicer that cuts the whole vegetable, skin and all, into thin, semi-detached rounds. Gently separate the slices until the potato unspools into a single, beautiful ribbon. The potato (still on the stick) is then salted, flavored, perhaps lightly breaded and deep-fried. The Good: At the My Tornado Potato Truck, their signature ($3.50) item evokes the crispness of potato chips but retains the fluffy interior. My favorite is the Truffle Tornado, which for an extra dollar comes dusted with truffle salt. It's fantastic, and not just for county fairs. It seems like the ideal, albeit low-margin, item for a food truck. The Bad: My Tornado Potato also offers eight standard "dressings" (French onion, cheddar, sour cream onion), most of which are powdered and ought to be avoided. The scant droppings of congealed, nuclear orange "cheddar" added nothing in the way of taste or visual appeal. And the Sausage Tornado ($5), while visually stunning (How do they slice the potato while keeping the hot dog whole? How do they embed the chips into the hot dog?) is a disappointment. Forget about snap. It's a mushy, über-salty tube of meat that tastes like it was made from the dregs of better hot dogs. The Ugly: There is no ugly. The tornado potato looks amazing and the red-and-orange truck with the white swirl on the truck is distinct and recognizable.